Meta-Nitro Benzene Sulfonic Acid sodium Salt Suppliers, Meta-Nitro Benzene Sulfonic Acid sodium Salt Manufacturers. 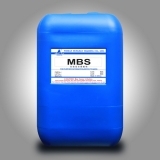 Product description: MBS(3-Nitrobenzenesulfonic acid sodium salt) 127-68-4 1.Synonym: MBS 2.MF:C6H4O5NSNa 3.Appearance:white powder 4.Assay: 90%min 5.Moisture: 3.0% max 6. Impurity: 0.2% max 7. PH value: 7-9 8. Application: It is used as a resisting agent for dyeing and printing go avoid forming striation which appear on coloring fibers with dyestuffs in the process of dyeing textile fibers, and as an oxidizing agent for electroplating technique, and as an intermediate for dyestuffs to synthesize other kinds of dyestuffs, etc.